Comments: This gift card can also be used in Sobeys etc. Litmit of 5 bonus offers per person. 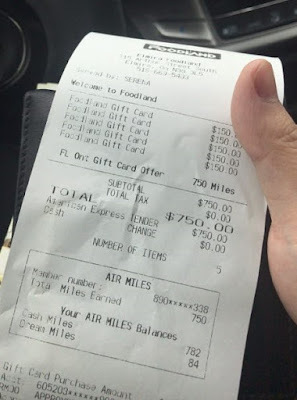 Actually, you can buy 5 gift cards in one transaction and get 750 Air Miles (value >$80). 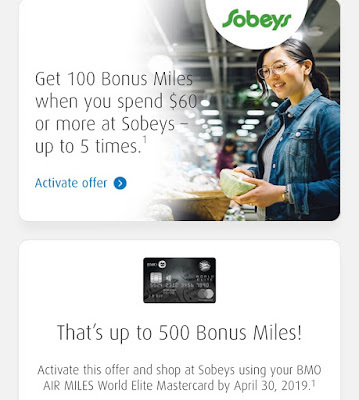 Comments: If you shop at Sobeys using your BMO Air Miles WEMC by Apr 30, 2019, you can get 100 bonus miles when you spend $60 or more each time (up to 5 times). So, totally, you can earn up to 500 bonus miles. This is a targeted offer. YMMV. I know someone got an offer that he can earn 50 bonus miles when he spend $100 or more at Sobeys before Apr 30, 2019. Comments: You can get up to 1000 Air Miles bonus when you spend $1000 in first 3 months from the date you open a new BMO Air Miles MasterCard. I think this card is pretty decent for a no annual fee MasterCard. The general BMO website offer for this card is only 800 Air Miles. This is open to all public now, as long as you collect Air Miles. Comments: Book between April 1 and 30, 2019, for travel until June 26, 2019. Blackout travel dates: May 17 to 21, 2019. 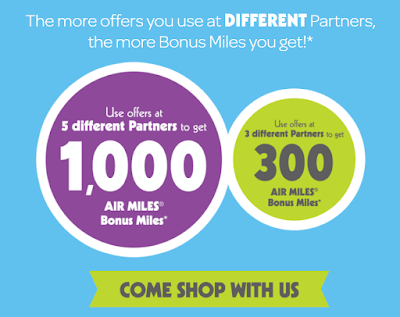 15% fewer AIR MILES Reward Miles for all Collectors and 25% fewer Miles for Onyx Collectors.